I thought it might be fun to document my latest project, painting Napoleonic French Dragoons. I’m starting with the excellent 1/72 Italeri set (pre-1812 uniform), later I will work on the wonderful 28mm Perry Miniature plastic set (post-1812 uniform). In both cases I’ll be painting a wargame unit of eight mounted figures based two to a base. The Italeri set is one of their best, the sculpting is excellent, the plastic is bendable but holds details very well, and the poses are very natural. I decided to do a few conversions just for fun. The first conversion is a head swap, replacing the Dragoon helmet with a tall bearskin which marks the figure as a member of the first company. Each Dragoon regiment had four squadrons, each made up of two companies. The first company was considered elite and comprised of men selected from the other companies in the regiment. I selected this figure because his tunic has epaulettes, another distinguishing feature of members of the elite company. The head comes from a grenadier from the Zvezda Napoleonic HQ Staff set. I had to use super glue to attach the head as plastic glue does not work on the Zvezda figures in that set. The second conversion is a re-positioning of one of the heads. As noted in the PSR review none of the figures are looking directly into the mold so that the mane on the Dragoon helmet could be sculpted accurately. On both of the conversions I positioned the head looking forward as I thought it looked odd to have all of the figures in the unit looking to the side. Plastic cement worked on the Italeri figures, although it did not really bond the plastic like it does with hard plastic scale models; I was able to break the head off again with little effort. In this pic you can see a little of the putty I used to fill the gap created by this conversion - it is Deluxe Materials Perfect Plastic Putty. I highly recommend this product; you apply a little to the figure and then use a wet finger to smooth it out. It is very easy to use and the shrinkage is minimal. This last figure isn’t really a conversion; I just added a musketoon from the Zvezda French Cuirassiers set (held in place for now by poster tack). All of the figures in this set should have a musketoon but Italeri omitted this item. The Dragoon’s musketoon was suspended in a sling by the boot with the barrel facing up. That’s it for now; next up is to start painting the horses. This is my first time painting cavalry so I’m using this project to try out different paint schemes for the various horse colors. Great project so far. I love the conversions. The site mentions that this practice was abandoned in wartime, but this is a good overview of the horse colors I would need to paint. As you can see on this site, there are a lot of variations in the colors of bays, chestnuts and grays. I really enjoyed painting these figures, the horse musculature really lends itself to painting highlights and the Italeri horses are really well sculpted. For now I just focused on getting the paint colors down; later I will go back and paint features such as the eyes and the markings often found on the legs and faces. This horse will be the mount for the converted elite company Dragoon with bearskin pictured in the original post. Black horses are usually described as very dark brown, so I started with a basecoat of Vallejo Model Color German Camo Black Brown, highlighted with P3 Umbral Umber and shaded with a black wash.
Sascha Herm is a terrific figure painter who features mainly historical figures on his site. Based on his paint choices I replaced the Foundry Bay Brown highlight with Foundry Chestnut 53B and Foundry Chestnut Light 53C. This one was pretty straight forward, I used the Wargames Foundry Chestnut triad but for the final highlight I added a little bit of P3 Menoth White Base. Last pic is of the gray, which will be the mount for the unit’s Trumpeter. Painting this figure should have been easy but it actually gave me quite a bit of trouble. I basecoated with a 1:6 mix of Vallejo Model Color Dark Sea Grey and White Grey but this was darker than I intended so I ended up adding a lot of highlight layers and my transitions got choppy as a result. I need to go back and add some glazes to smooth the transitions between highlights but I am happy with the strong contrast. I’ve tried various combinations of red-browns and orange-browns but I can’t seem to match this shade. If anyone has any recommendations please let me know. Any feedback or comments are appreciated. This topic reminded me of my old Creating Cavalry Regiments,here on Benno`s. I favour using the hot pin method myself to fix heads and riders to their mounts. Heads do not fall off and riders stay on even if the horse topples over. 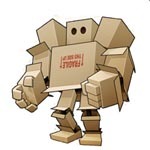 and I hope this info might be of further help for those getting a unique kick out of converting figures. Once again the paints I used came from Sascha Herm, in this case Coat D'Arms Hairy Brown and Barbarian Leather. This was my first time using Coat D'Arms paint, they're not easy to get here in the U.S. but I have always wanted to try them because I read that these were the original Citadel paints and possibly the same manufacturer that produces Privateer Press and Wargames Foundry paints, two of my favorite lines. The Coat D'Arms paints come in the same flip top bottles as P3 and Foundry but are much thinner; it took 3 - 4 layers to get a solid base coat on white primer. This isn’t the exact color I was aiming for but it’s brown, it looks like a horse, I think that’s enough for now. Here are all of the horses in the unit together, I still need to paint all of the markings and then the bodies will be done, I’ll paint the horse saddles and harnesses later. One minor note about the choice of horses as it relates to the horse saddles and accessories – PSR notes that the cloth pistol-holster covers are on top of the sheepskin shabraque when they should be underneath, however this is only true on some of the poses. Two of the poses (6 of the figures) have the correct arrangement so I have used all six of those figures. The first pose on the left is the figure I’m using for the officer (and in the case of this figure the regimental eagle bearer), the middle figure is one of the two charging poses and the right figure is one of the two poses with the pistol-holster covers correctly on top of the sheepskin shabraque. That's all for now, as always any comments or feedback are appreciated. I managed to get some painting done this weekend, I painted the horses' bridles, reins and sheepskins and I started on the riders. The dragoon's tunics have yellow turnbacks as I'm painting them as the 23e Régiment de Dragons. The 23rd regiment had vertical false pockets on the back of their tunics whereas the Italeri dragoons have horizontal pockets, but I'm not enough of a button counter to mind. I have struggled with painting yellow in the past but this time it wasn't so bad. I used a base of P3 Sulphuric Yellow with some P3 Menoth White Highlight added for highlights. For shading I used P3 Ember Orange and Wargames Foundry Chestnut base. I'm happy with the results. It's not nearly as good as the NMM in the video but for 1/72 I think it is plenty good. The last figure is not meant to depict a gruesome battlefield decapitation, it is one of the converted figures in the original post. The head popped off as I was re-positioning it in the poster tack I use to hold my figures in place while painting. As I mentioned in the original post plastic glue seemed to work on the Italeri figures but did not actually bond the plastic. I wish I had remembered Beano Boy's thread about attaching head's with a hot pin before I started painting, at this point I will probably just use super glue to reattach the head. That's all for now, the next thing to do is the green tunics. I'm going to use the Wargames Foundry French Dragoon Green triad but I need to do some test painting first as it is my first time using the paints. As always any feedback is appreciated. I got a lot of painting done this week, starting with Dragoon Green. For this color I used the Wargames Foundry French Dragoon triad for the first time. The base color might be the thinnest paint I have ever used, it took 4-5 coats to get a solid base down on white primer, it can be used as a wash right out of the bottle. While it was a hassle to get the base coat down it is a very accurate version of the "middle green" of the Dragoon tunics and horse-cloth. In the picture above you can see the guidon carried by Dragoons from 1804 to 1812. The Italeri guidon has an eagle in the center which is the version used by the Dragoons of the Guard. As I'm painting these as a line regiment I have just left it white (there should be text in the center but I wasn't going to attempt to paint that in this scale). I painted the faces using my usual combination of the P3 flesh paints. If you look closely at the picture above you can see that the trumpeter's checks are filled with air as he prepares to blow the trumpet. Little details like this are what makes this one of Italeri's best sets. If you compare this picture to the one of the same two figures in the previous post you might notice that the mane on the trumpeter's helmet has changed color from black to white. French cavalry musicians were given uniforms and sheepskins in the opposite color and usually rode on grey horses to make them easier to spot in combat. I have to mention that these Italeri figures are a joy to paint. Minor details such as the edges of the horse-cloth, the hair sticking out from below the Dragoon helmets, belts, buckles, etc. have all been sculpted which make the details much easier to paint. Italeri did not take any shortcuts when preparing this set. I painted 28mm Victrix Napoleonic infantry once and I found details were not sculpted in many places which made painting those figures a chore. Imho the Italeri figures compare well to Perry 28mm plastics which I consider to be the finest Napoleonic figures. The last figure in the picture above has his head reattached with super glue. In this picture you can also see my attempt at NMM on the sabers. I had a bit of trouble with this, the sabers are not cast very well, almost all had flash which was difficult to clean, probably a result of the position of the figures in relation to the mould. This is really the only negative thing I can say about this set and is not that big a deal. Finally here's a group shot of the entire unit so far. Interesting how much the officer looks like the one in the box art, I'm guessing the artist must have seen the figures beforehand. I have to paint the horse markings and do some clean up in some spots but other than that the painting is done. Next it is on to the basing. They look the full ticket, meaning spot on. meaning excellently Good! Your horse-bodies are quite uni-coloured. Very nice project! But I have to be updated! The guy in the bearskin? What is he? I know that he belongs there, but I don't remember why. Thank you for the link sansovino. After I posted these pictures I added markings to the legs and faces of some of the horses. @Susofrick: Thank You! Please see the original post for more information on the figure with the bearskin. Almost done with this unit, I added head and leg markings to some of the horses, now the last thing to do is the basing. My basing method has evolved over the years and while it may seem a bit laborious I really like the results. The first step after gluing the figures to the base is to add some filler to level the surface of the base with the integrated base of the figures. Many modelers use plaster for filler but I use textured medium, in this Golden Coarse Pumice Gel mixed with Liquitex Resin Sand which makes the gel easier to spread. I then give this layer a quick coat of earth colored paint. When I first started modeling this was the only base layer I applied so I used texture gel so I that I could add a quick drybrush. The pic below is a good close up of some of the leg markings I added since the last update. After a few years of modeling I tried something new - as I started modeling vehicles I began using pigments for weathering and I decided to try adding pigments to my bases to see how it looked. In the pic above you can see the results. I don't use dedicated weathering powders or pigments such as the ones from Mig Productions, instead I use the old school modeling technique of making pigments from pastel chalk. My pigment "fixer" is a mix of Vallejo thinner and varnish. First I brush on a thin layer of the fixer, then using an old synthetic brush I scoop up some of the pigment and then drop it into the fixer using the head of the brush to spread it around. I think this technique produces very natural looking bases, much better than drybrushed sand or texture gel. I tried using pigments without the textured gel underneath but it didn’t look as good, I think the uneven surface of the gel makes the pigment layer look more like real ground. Also I still cover the textured gel with a coat of earth color paint as it can be tough to get the pigments in some spots. This technique can be messy and I have to be careful not to get pigment on parts of the models I did not intend, but this can also work to an advantage by applying some to the feet of the models it makes them look like they're walking through dirt and mud as they would have in reality. Another close up of some of the horse face markings I added since the last update. The chestnut received a "blaze" while the dark bay received a "star." I'm definitely in the home stretch now, just need to add some grass to the bases and I can call these done. As always any comments or feedback is appreciated. As I mentioned in my previous update the last thing I needed to do was to add grass to the bases. I experimented with various brands of static grass but I never found one that I liked. Eventually I came across Woodland Scenics fine turf. Designed for railroad layouts, I like the effect on wargame bases. Here is how it looks on one of the bases in this unit. This last pic gives a good view of the converted figure from the original post; you can see how the horsehair mane is straight back, not to one side. So that’s it for this part of the project, I’m going to post more pics of the finished unit in the gallery section of the 1/72 forum in a separate thread for my 1/72 Nappies. 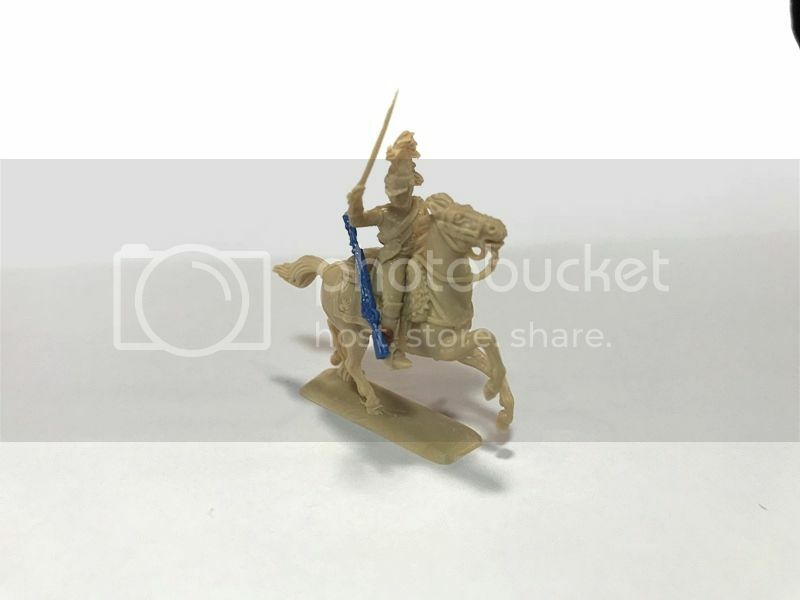 After that I’m going to keep this Dragoon project going with a second WIP thread in the other scales forum for the Perry 28mm French Napoleonic Dragoons. So more to come. I REALLY like how those bases turned out. Much more convincing grass than many others I have seen. Horse and riders are nice, too. If a tad glossy. Bluefalchion wrote: Horse and riders are nice, too. If a tad glossy. This is true, my preferred paints (P3, Foundry) leave a satin finish. Vallejo Model Color on the other hand leaves a very matte finish. I used Vallejo for the "black" (actually German Grey) boots and horsehair manes, you might be able to see the difference in sheen between those parts of the figures and the uniforms painted with P3 and Foundry. Also when I take pictures of my miniatures I have 3 different lamps very close to the figures so that also contributes to some of the shine as well, they aren't nearly as shiny under natural light. I don't use a matte varnish on my figures, I find that the matte finish reduces the contrast and my highlights and shadows are rather subtle. I respect the high contrast style of painters such as Kevin Dallimore and Sasha Herm but that style never worked for me. So I don't use a matte varnish to finish, the slightly glossy finish never really bothered me. Thanks to everyone for the likes and feedback on this thread. Thanks for the explanation. Indeed, there are many different styles and techniques for creating good miniatures. I am insufficiently skilled to pull many of them off. I use woodfiller and birthsand for my bases.